Clarets skipper Tom Heaton is in line to make a return to action tomorrow after five months out. The England international suffered a dislocated shoulder in the 1-0 win at home to Crystal Palace on September 10th. 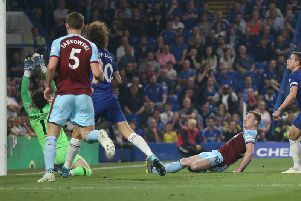 But after working his way back to fitness, the 31-year-old is set to get some gametime under his belt in a behind closed doors outing against Blackpool. Heaton, who had surgery on his shoulder after the injury, returned to training in January with coach Billy Mercer and the rest of the goalkeeping group – Nick Pope, who has performed admirably in his absence, Andres Lingaard and Adam Legzdins. And he recently joined in full training, but needs games to get back up to speed. He was pencilled in to feature as the Under 23s take on Bolton Wanderers in the Professional Development League at the Macron Stadium on Wednesday night, but could instead play today in a bounce game. Boss Sean Dyche said last month when asked if Heaton will feature for the Under 23s before making a first team return: “Definitely. Defenders like to get their eye in, goalkeepers like to get their eye in, that game-ready feel. I think that’s important.